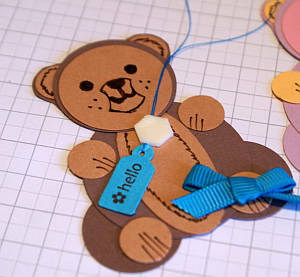 In Papercraft Bear 2 you will be able to finish your teddy. Just follow the steps I am about to go through with you. We're up to the finishing touches now. In the next step, use your Stampin' Write Chocolate Chip marker to add some circle eyes, some freckles, then some ear and tummy fur. Don't forget to add some pen strokes to the paws to make it look as though teddy has claws. 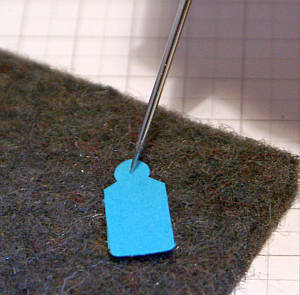 Now punch out a jewelry tag (this punch is now retired) and pierce it with a piercing tool on a soft mat. I chose Tempting Turquoise cardstock. You will use this hole to thread your choice of thread through and use that to attach the tag to the teddy. Next I used the now retired Tiny Tags stamps to add a sentiment to my jewelry tag. It was so easy to place it right where I wanted it by using an acrylic block to stamp. 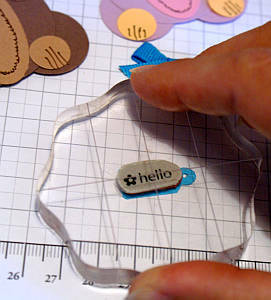 You could use any shape of tiny tag for this step such as a small circle or oval shape. even a star, heart or square would look nice. Or a rattle. Wouldn't that look cute? Then I made a bow with a length of Tempting Turquoise ribbon. 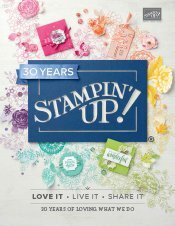 I used a Stampin' Dimensional to attach the threaded jewelry tag to the teddy, then pressed the bow to the Stampin' Dimensional too. After I had done that, I wished I had trimmed the Stampin' Dimensional a bit smaller. It would not have shown as much. Live and learn! I did trim the sticky pad for the pink teddy card and it did work out better. The final touch was to trim away some of the 1" circles behind the ears, just leaving a rim of colour to define the inside of the ears. I thought it looked more bear-like that way. 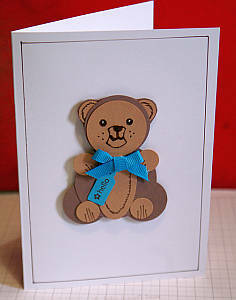 Now your can use your completed teddies on a handmade greeting card or in a scrapbook layout. I made a couple of cards with mine to show you how they would look in pink or blue (see pictures below). I'm thinking of making a few more to add to a scrapbook page. 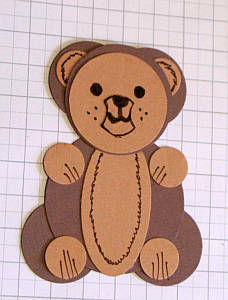 I hope you have enjoyed the instructions I called Papercraft Bear 2 and are now ready to make your own teddies. Have fun choosing colours and embellishments to suit your own purposes.